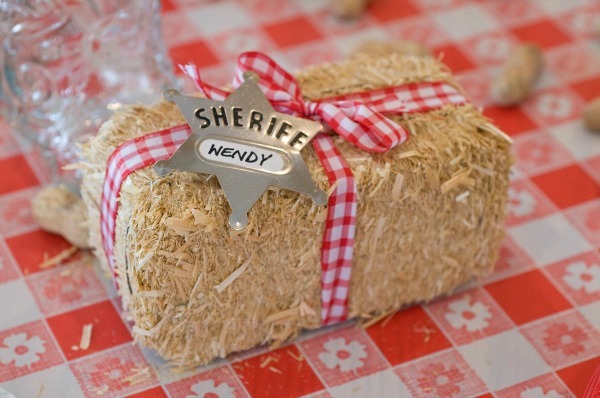 Make your guests get into the party's mood by sending them a cowboy themed invitations. 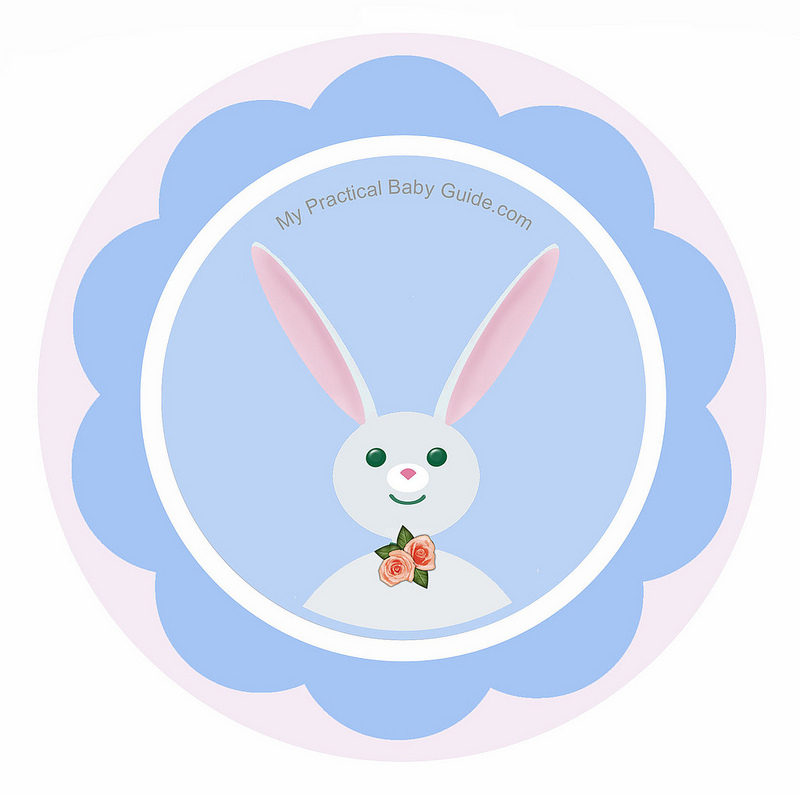 If you don't have the time to make it yourself , buy a custom made invitations. 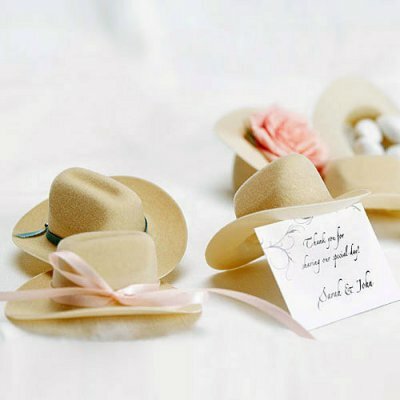 At Tiny Prints you will find a large selection of custom cowboy themed invitations for a girl, boy and twins. Decorate the house with stuffed animals such as cows and horses. Placing couple of hay bales around the house will give an authentic western look and feel. Make your Western scene realistic with the white Longhorn Skull and brown Wagon Wheel. 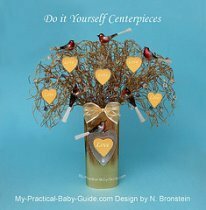 This is a suggestion for table arrangement for a western cowboy baby shower theme. The color scheme is blue, red and brown. Tie a raffia table skirt around the table, add color by tying blue and red bandanas around the table. Cover the table with red gingham tablecloth or choose a solid color. 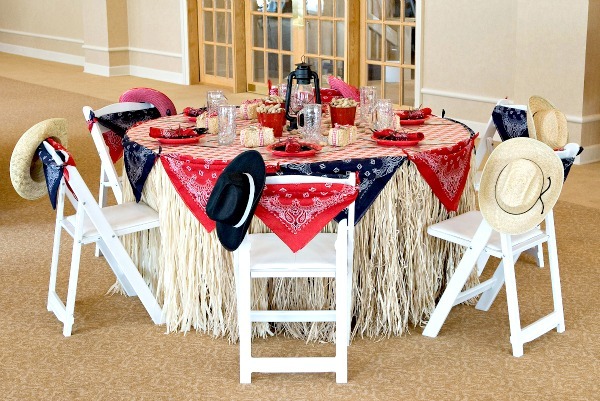 Decorate the chairs with bandanas and cowboy hats. Cut a hard paper to a star shape and place it on the table as a place mate. Use red and black solid plates. 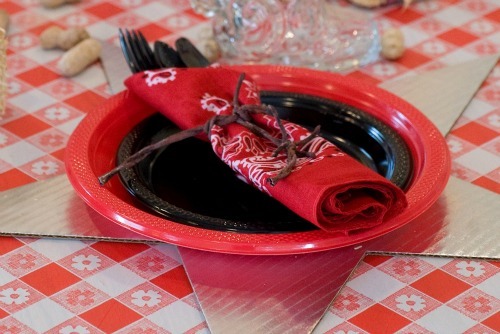 Cover a black cutlery with a red bandana and tie with a ribbon. 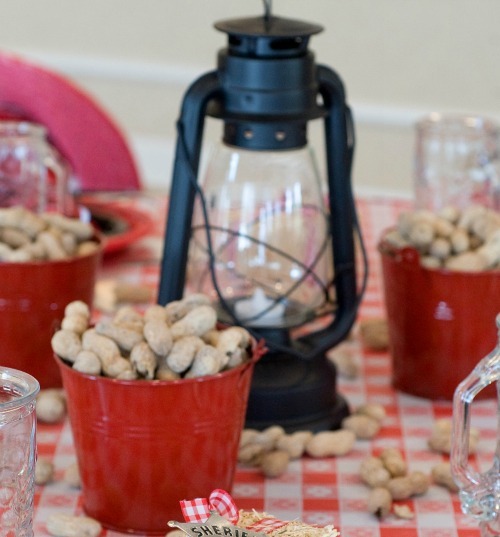 Place tin buckets on the table and fill them with peanuts, pretzels or other snacks. 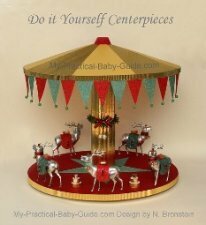 As for the centerpiece use mini hay bales and western lantern. Where can you buy all these western supplies? You can also find western supplies at Big Dot of Happiness. 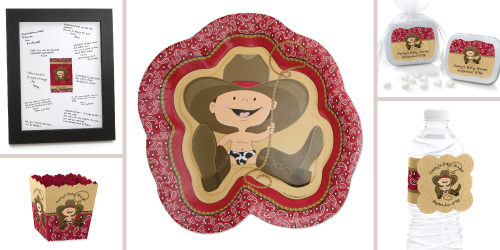 Click on the photo to see these cowboy theme supplies. 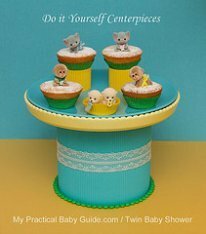 Dress up cupcakes with toppers to match your theme. 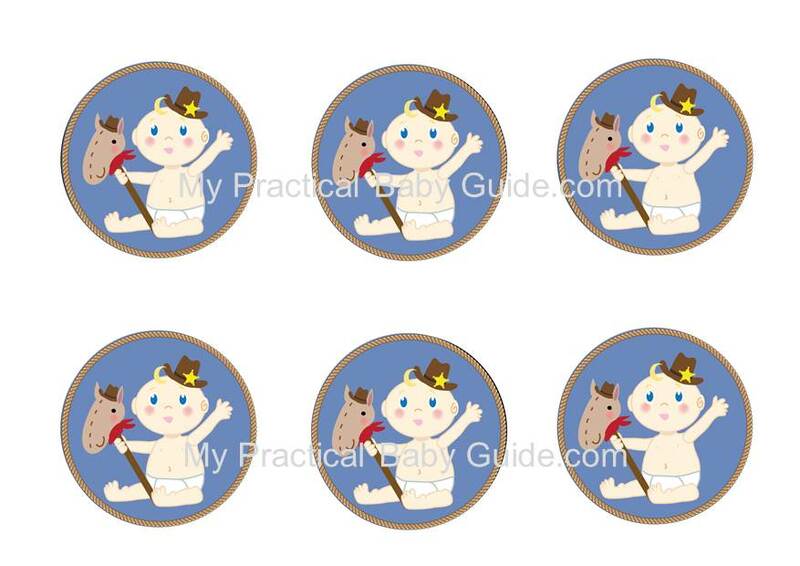 Use our free cowboy baby shower printable toppers to decorate your cupcakes. Dress up water bottles with labels to match your party. This adds just a little bit of fun to boring water bottles and helps to tie the entire theme together. 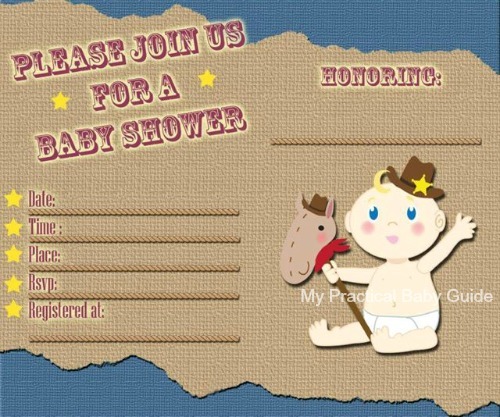 Soon I will publish a free cowboy baby shower label to decorate your bottles. Come visit us again to see the new design. If you like DIY projects, this one is just for you. 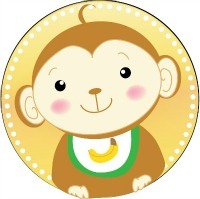 Buy Western Foam Sticker Shapes (see photo below) and make wooden shaped magnets decorated with these stickers. 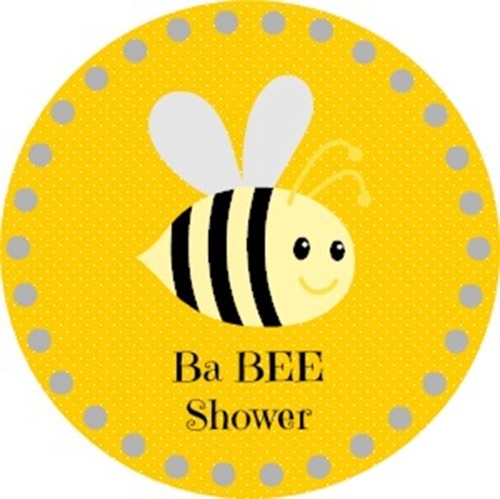 Your guests will be delighted to get these little favors. 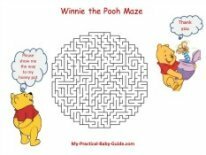 Click here for tutorial. I found these adorable mini cowboy hats. 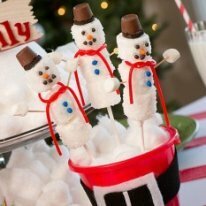 They can be used as a place card holder or, turned over, as mini candy dishes. 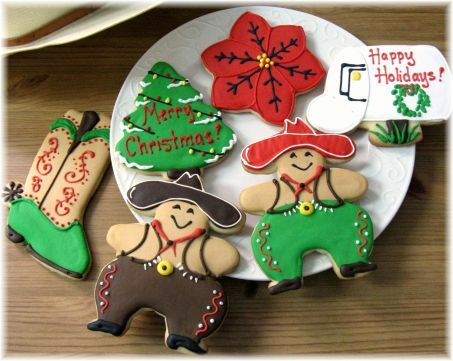 Decorated cowboy cookies make great party favors to send home with guests. If you don't have time to make cookies and decorate them you can always buy some. See the cowboy cookies in the photo. The menu I recommended for the evening (think cowboy's food) contains finger sandwiches, dips, chips and salsa. Beverages: lemonade, iced tea and old fashioned bottled sodas (Coca-Cola, Crush, Root Beer & Cream Soda). And for the dessert table: A cowboy decorated cake that can be designed with features like a lasso, cowboy hat, boots, etc. , cupcakes, decorated cowboy cookies, stick candy, cotton candy, mix nuts, shredded coconut, raisins, dried banana chips, and chocolate chips.